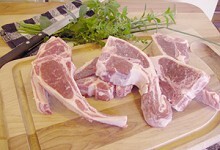 Ruppert's Corriedale freezer lamb is sold by the whole or half lamb and is available in summer/early fall. Contact Us now to place your order. in our selective breeding process designed to produce the finest stock. in the careful feeding of our animals with natural grains and high-quality forage. in the meticulous processing that includes federal inspection before the meat is cut, hand-trimmed and quick frozen. Due to the high cost of shipping, we are unable to offer lamb except in our immediate area off the farm. We are within easy driving distance from Harrisburg, PA, Washington, D.C. and Baltimore, MD. Please contact us for further details. Lamb is great for grilling! Combine soy sauce, vinegar, vegetable oil, garlic and ginger in a large shallow container. Add lamb and marinate, covered, in refrigerator overnight. Remove lamb from marinade and alternate with other ingredients on skewers. Grill (or broil) over medium coals, 5 minutes on each side. Roast lamb is a traditional favorite! Heat lamb for 25 minutes in 450°F oven. Reduce oven to 225°-250°F. Roast lamb for 6 hours. Combine vinegar and oil and baste lamb often. Sprinkle a generous amount of rosemary, salt and pepper to taste. Lamb should be tender and juicy and still pink in the center. Serve with mint sauce or mint jelly. For more recipes and nutritional information, visit the American Sheep Industry Association. This recipe was a winner in the Grand Lamb Cook-Off years ago at the Maryland Sheep and Wool Festival. It was submitted by Joanne Oxley. I have used it many times and it is a favorite with my family and friends. Place lamb on rack in shallow roasting pan. Make several slits on the outside of the lamb and insert garlic slices. Combine ginger and mustard and rub on the outside of the lamb. Bake at 325 degrees for 1 hour. Combine cranberry sauce and preserves in a saucepan. Cook over low heat until melted; stir in wine. Spoon sauce over the lamb and bake an additional 1 hour and 15 minutes before carving. Skim fat from pan drippings. Take remaining drippings and add enough water to measure 1 ¼ cups. Pour cranberry drippings into saucepan. Combine flour and ¼ cup of water, mixing well. Add flour mixture to pan drippings. Cook over medium heat, stirring constantly, until gravy is thickened. Stir in salt and pepper to taste. Slice lamb and serve with gravy and lamb stuffing. Melt butter in saucepan over medium-low heat. Add onion and cook until soft and lightly browned. Remove from heat and stir in ginger, pecans, apple, orange peel and salt. Add enough water so that stuffing is moist not saturated. (Start with ½ cup of water then gradually add more). Place dressing in a compact casserole dish and place in the oven alongside the lamb. Cook the stuffing for approximately 45 minutes, or until the top is crisp and golden. If the stuffing is browning too quickly, cover the top of the casserole with aluminum foil. This recipe was given to me by Florence Hall, one of the founders of the Maryland Sheep and Wool Festival. Florence was an excellent cook and ran a catering business for a number of years. Serve this on plump, warm hamburger rolls.